As I end my internship here at SAALT I would like to start off by thanking Deepa, Aaditi, Priya and Mou for one of the best internship experiences possible. Not only were they great supervisors but they were also great mentors. I started my internship here at SAALT not really understanding what issues faced South Asians in America. For me, a relatively sheltered Indian who grew up in Tucson, Arizona all Desis are pretty much doctors or engineers. 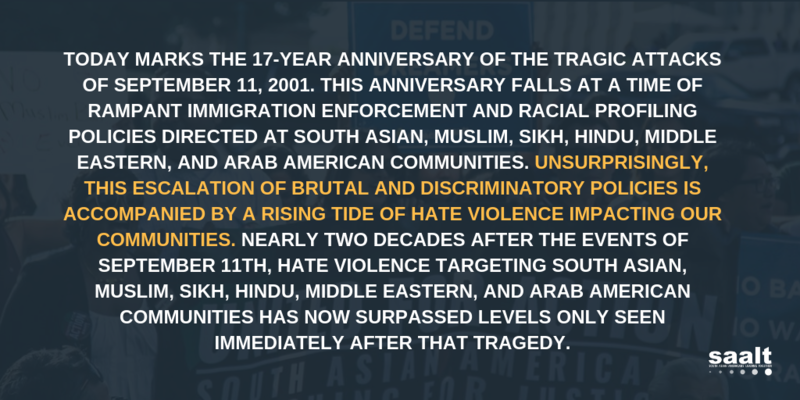 But after getting into this internship and being exposed to varying facets of the South Asian community, I have come to realize that there are serious problems that affect the South Asian community that deserve our time and attention, whether it be based around Immigration Reform or Hate Crimes. During my internship here at SAALT, I was fortunate enough to take part in the JACL (Japanese American Citizens League) Collegiate Conference, attend various Hill briefings and help to put on in person training sessions for various women led non profits. I have gained a thorough understanding of what it takes to run a small but influential nonprofit, the skills needed to multitask with about 10 different deadlines looming overhead, and finally the patience needed to understand that change does not happen overnight. So I would like to end by thanking SAALT for a great 9 weeks and wishing them luck with all future endeavors! Four years ago, Sikh transit workers in New York City decided that enough was enough. In response to a “turban-branding” policy that required workers, both Sikh and Muslim, to brand their turbans with the Metroplitan Transit Authority (MTA) logo, Sikh transit workers called on the MTA to end this policy, deeming it an act of religious discrimination. Furthermore, in 2005, the Department of Justice found that, over the course of three days, there had been two hundred cases of MTA employees wearing some form of headdress without the logo, including Yankees hats, yaarmulkes, and a number of winter hats in fact issued by the MTA. The Department of Justice consequently filed a discrimination suit against the MTA. Yet for years, this issue has been placed on the back burner by city officials. While this issue is being addressed for a small number of Sikhs in New York, it still speaks to a greater issue that many South Asian and Arab individuals in the US face on a day-to-day basis. Even today, the concept of religious wear is quite foreign to American culture. Many do not realize that a turban, hijab, or any type of religious wear is representative of an individual’s spiritual life, and is therefore a very personal and private entity. Like any article of faith, it is not something that can just be set aside for appearance’s sake, never mind branded with a corporate logo. The lawsuit against the MTA has yet to be resolved, and we are hoping for an end to this discriminatory policy. In the meantime, it is important to keep this in a wider context and recognize that if this lawsuit goes through, it is a small step in a long journey to addressing discrimination against Sikhs and Muslims in the United States.